"I expect there are official bird counts and so on but I wanted you to know that on December 1st, while I was struggling, bad-tempered in the rain and cold trying to get my Christmas lights organized, I suddenly heard that unmistakable overhead clamour of beating wings and mass hysteria." "I looked up to see several overlapping vees forming a skein of about 150 trumpeter swans arriving (east to west) over Cowichan Bay. All of a sudden my lights sprang to life, a big smile spread over my face and it seemed that the spirit of Christmas had come early." The Grande Prairie region is home to a large number of Trumpeter Swans during the spring and summer. Saskatoon Island Provincial Park – located 25 kilometers west of Grande Prairie on Highway 43 and three kilometers north on Range Road 81 – is in the Grande Prairie Trumpeter Swan Important Bird Area and is a designated Federal Migratory Bird Sanctuary. The Fall Fair highlights Trumpeter Swans and other wildlife. This interesting article, from a few years back, highlights the return of the Trumpeter Swan to British Columbia, and the issues of feeding in newly planted fields. Lead poisoning is a serious and usually fatal outcome for swans ingesting lead ammunition pellets or fishing sinkers. Judson Lake straddles British Columbia and Washington state. TTSS has worked for decades with partners such as the Canadian Wildlife Service, the United States Fish and Wildlife Service and the Washington Department of Fish and Wildlife to address lead poisoning issues at Judson Lake. 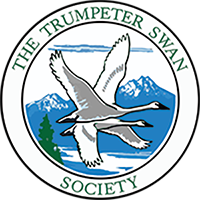 Somenos Marsh Wildlife Society hosted TTSS's 24th Swan Conference in 2016. There are many wintering swans, both Trumpeter and Tundra Swans in the area. The Society does a winter bird count as well. More than 10% of Yukon's population attend this six week event to welcome back migrating birds. April- May.